“M” is for ‘Monday’ | Eating well, with creative recipes, to follow the Fasting Lifestyle according to Michael Mosley's "Fast Diet." For us, a Monday Fast Day usually features a breakfast involving one egg and a dinner of seafood. In this menu, both meals begin with ‘m’ — as in Monday and marvelous and m-m-good. Whisk the egg with the chiles and carne. Heat a dry, well-seasoned cast iron skillet and add the tortilla until it is warm, soft, and just beginning to brown. Take it out and keep warm in a tea towel. In the cast iron pan, put a spritz of oil and scramble the egg to your preference. Place it on top of the tortilla. Dose with hot sauce [optional] and sprinkle with the cheese. Pop it in the toaster oven and toast for 1-2 mins. Plate with the apple and pour your smoothie/cider. Whisk the milk and cocoa thoroughly, then add the coffee. ‘Cafe Mocha’ is typical at the Frontier Restaurant. Mussels in Broth 290 calories We love mussels and we eat them all summer long when they are fresh. Very good mussels can also be purchased frozen. An excellent source of protein and low in fat and carbs, mussels are superb diet food. Rinse the mussel shells in case they are muddy. Discard any that are broken or do not close when rapped gently on the counter. In a large pot [volume will expand as mussels’ shells open], combine the water, wine, and flavorings. Bring water to a boil and add the mussels and cover. 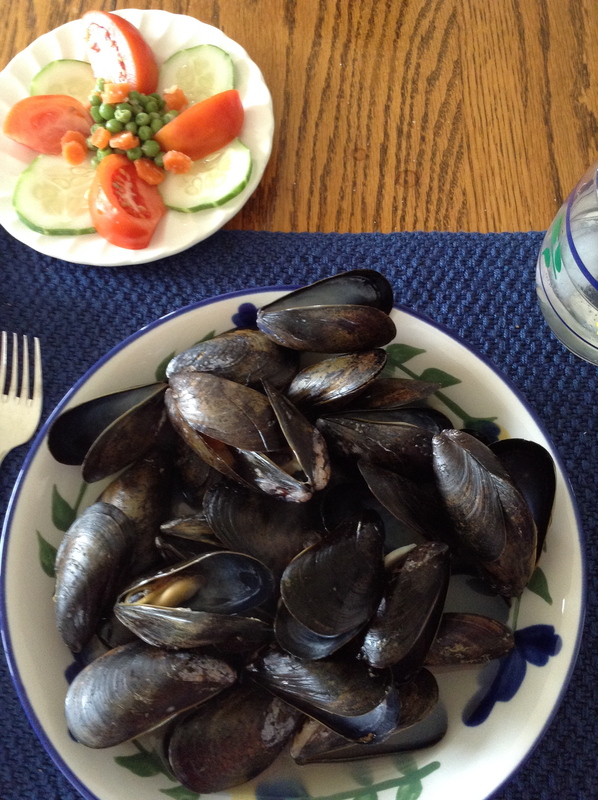 Cook for 10 minutes, then stir mussels up from the bottom with a long-handled spoon. Cover and continue to cook for another 5 minutes, until all shells are open. Discard any that refuse to. Dig out the mussels then strain the broth over them in the bowl. Plate the veg. After you eat the mussels, drink the flavorful broth. Tastes like summer to me!